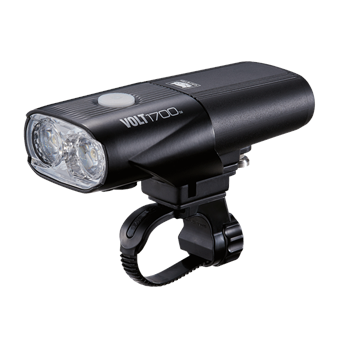 The Volt 1700 is CatEye’s most user-friendly, high powered rechargeable light, offering enhanced light distribution on or off the beaten track. Not only does it pump out an extra 100 Lm over the Volt 1600, it also benefits from side visibility, a tool-free replaceable cartridge battery, a 3 level battery indicator and a significantly shorter recharging time. With 5 modes giving run times from 2 – 150 hrs, the Volt 1700 does it all. Chip LED x 2, 1700 Lumen maximum output. Super powerful wide beam with Opticube technology & sideways visibility. USB Li-ion rechargeable, tool-free, replaceable cartridge battery. Large mode button for ease of use when wearing gloves. When charging: Red = less than 50% charged / Orange = more than 50% charged / Green = charging completed. When illuminated: Orange = battery capacity 50-31% / Red = 30-16% / Red flash = less than 15% remaining. Double click to High Mode. Single click returns to the previous mode. Recharge time: 5.5 - 15 hrs. High: 1700 Lm, 2 hrs. Medium: 500 Lm, 5 hrs. Low: 200 Lm, 15 hrs. Hyper Constant: 200/1700 Lm, 12 hrs. Flashing: 200 Lm, 150 hrs. So far so good used it about 7 times, Excellent light can see ahead. need to dip beam when someone approaching as it can blind them.